The Metropolitan Cathedral provides a quiet, peaceful place of escape from the noisy city outside. Ppposite the city's busy Central Park. 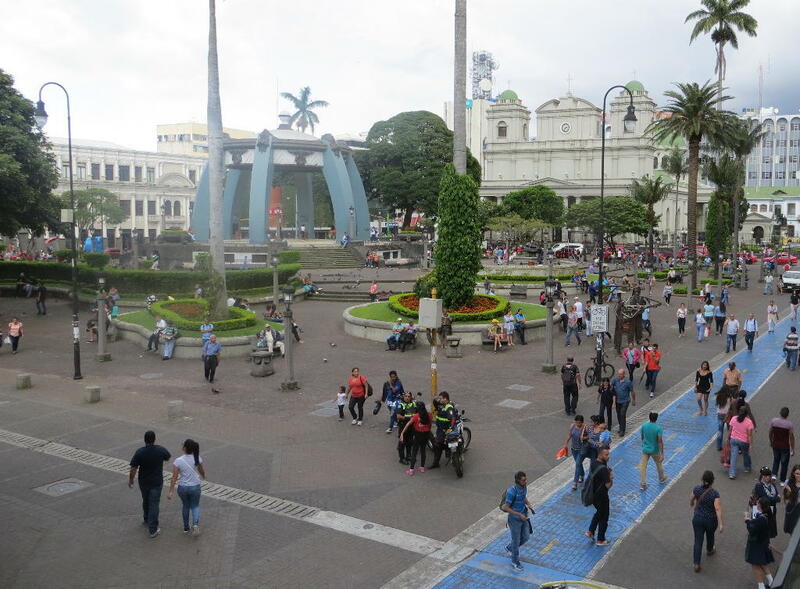 It is an important part of the daily life of people in Downtown San José. Why do we go to church? If we are religious, we go to worship God. However, some of us go because it is a social event; or for others, we go because it is a social obligation (we are expected to go). When we were children, many of us went to church because our parents made us. 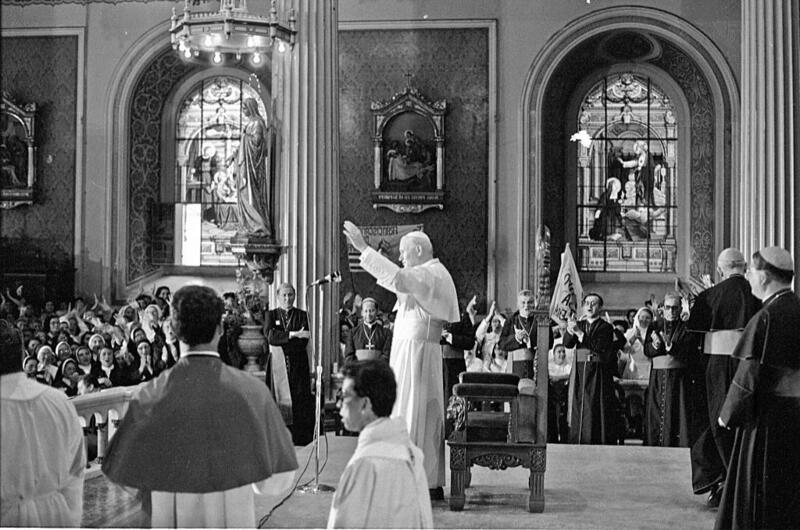 Pope John Paul II’s visit to the Cathedral in March1983. The visit is considered the most important event in the Cathedral’s long history. Note the expressions on the faces of some of the attendees as the Pope celebrates mass. Here is another good reason: We can go to church because it is beautiful. In the case of the Metropolitan Cathedral (Catedral metropolitana de San José), the main Catholic church in San José, it is indeed very beautiful, and it is an important building, rich with art, history and culture. 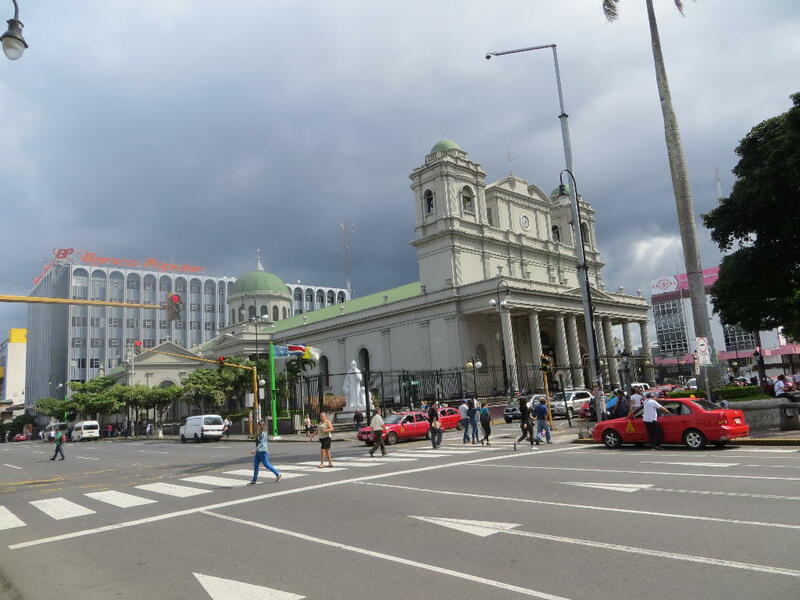 The Metropolitan Cathedral is located in the heart of Downtown San José, two blocks west of the National Theater, across the street from the city’s Central Park. It is the headquarters for the Roman Catholic hierarchy in San José. The Cathedral was built in the 1870’s after an earthquake destroyed a smaller church on the site. It was designed by a Spanish architect in a style that is considered “neo-classical.” The front of the building features a facade with three towers; a clock tower in the center and two bell towers. There are Doric pillars supporting an overhang that covers a wide front portico. Behind the facade is the long body of the church and at its eastern end is a small cupola, or dome, which covers the altar. In the Cathedral’s 140-year history, parts of the building have been closed several times for restoration and strengthening. The most recent time was in the 1990’s, after damage was caused by a series of strong earthquakes. Once inside, you will escape the noise and the bustle of the city outside, and you cannot help but be impressed with what a peaceful, spiritual, and yes, sacred place this is. The long body, or nave, of the Cathedral features a vaulted ceiling supported by classic columns that run all the way to the altar. There are many things to see as you explore this historic Cathedral, but for me, the most fascinating features are the dazzling stain glass windows. These are a collection of French-made masterpieces on either side of the cathedral. They are from the Champigneulle Factory in Paris, and they depict Biblical scenes of Jesus, the Holy Family and various saints. 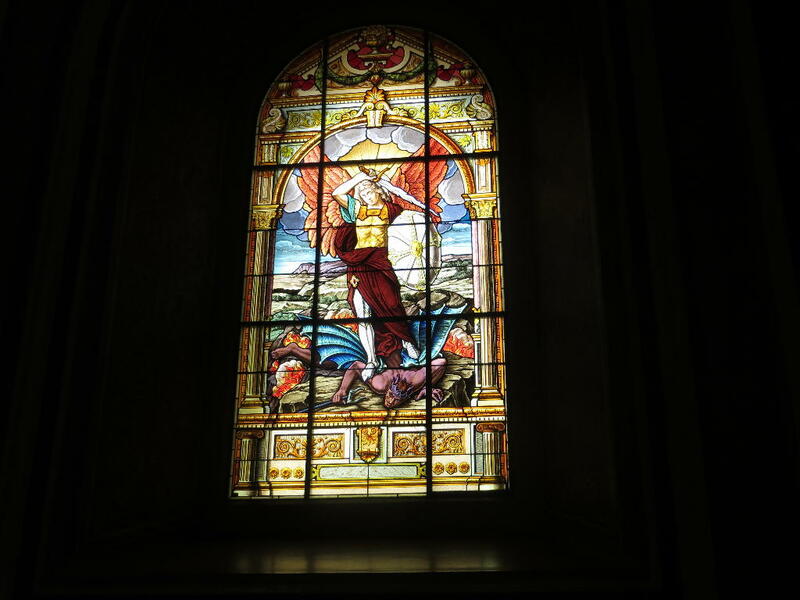 One of the most moving is a window that powerfully illustrates Saint Michael the Archangel defeating Satan. As you walk the length of the Cathedral, you will see fourteen bas-reliefs mounted on the walls. These are the Stations of the Cross, fourteen scenes that depict the suffering of Jesus Christ on the way to His crucifixion. 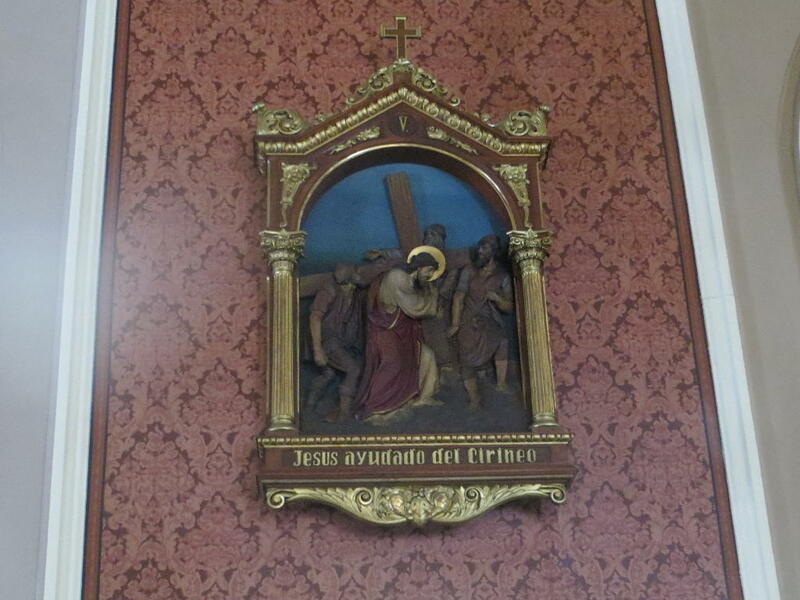 If you were not fortunate enough to have been raised a Catholic, the Stations of the Cross are commemorated each Friday during the season of Lent. The bas-reliefs at the Cathedral were sculpted by an Italian artist and then painted with oils. At the eastern end of the Cathedral is the magnificent altar area that is capped by the cupola. The cupola has windows around its base which allows natural sunlight to bath the altar during daylight hours. This creates a wonderful special effect: While the main body of the Cathedral is softly lit, the altar appears to glow. 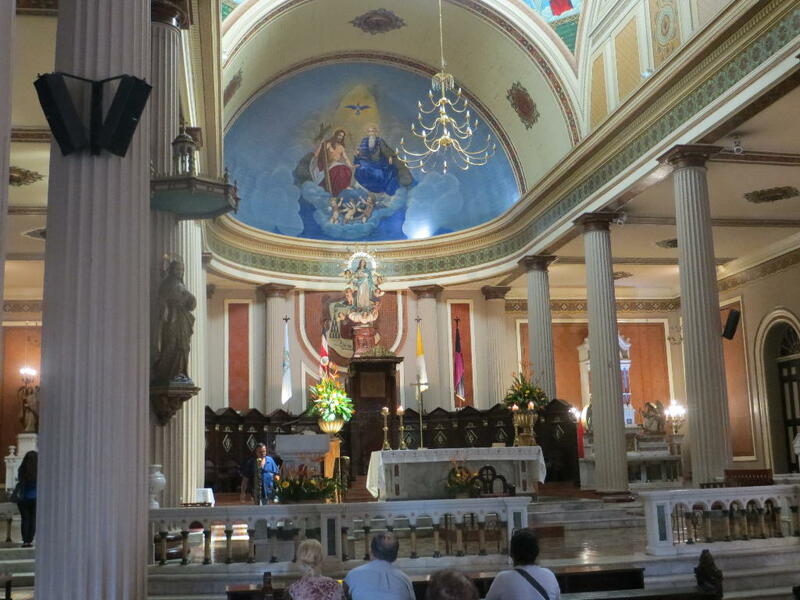 Above the altar is a mural of Jesus and the Holy Father. As you face the altar, and turn to the left, you will discover a small chapel in a separate room. This is the Chapel of the Holy Sacrament. This very quiet and very solemn room is a replica of the original chapel that was demolished. It has its own series of stain glass windows and ornate statues of angels. Throughout the Cathedral, you will see all kinds of interesting objects. There are statues of cherubs and paintings of holy scenes. There are life-size reproductions of Christ and the Virgin Mary. 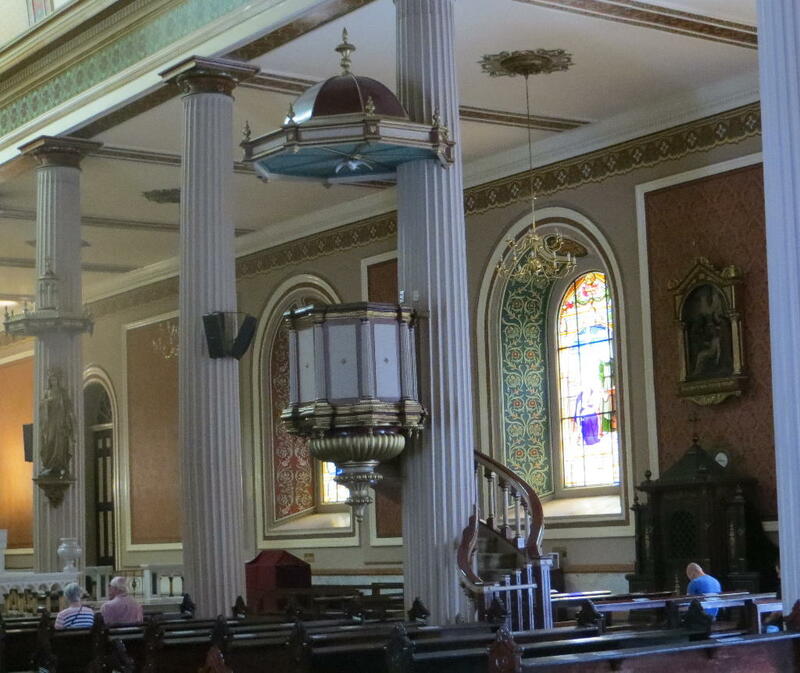 Secured to one of the columns, is a beautifully designed raised pulpit built with Costa Rican hardwood. This “flying pulpit” has a winding staircase leading to it, and it is the work of a Guatemalan master craftsman who designed many of the interior features. Even the floor is beautiful, made of a painstakingly laid out colonial-style mosaic tile that runs the length of the building. Up in the choir loft, there is a huge pipe organ imported from Belgium in the 1890’s. 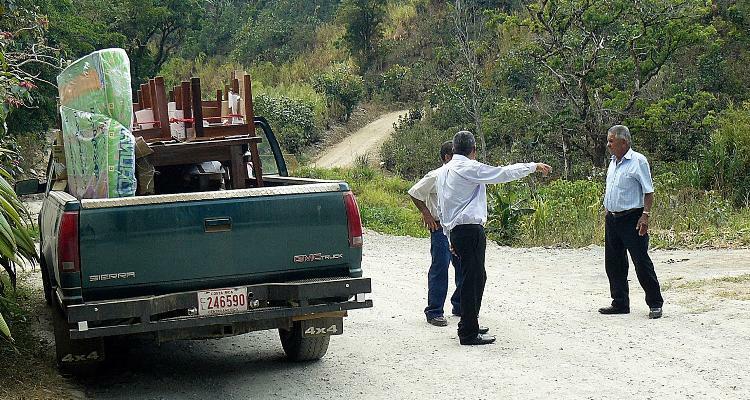 It is considered to be one of the most important antique organs in Central America. 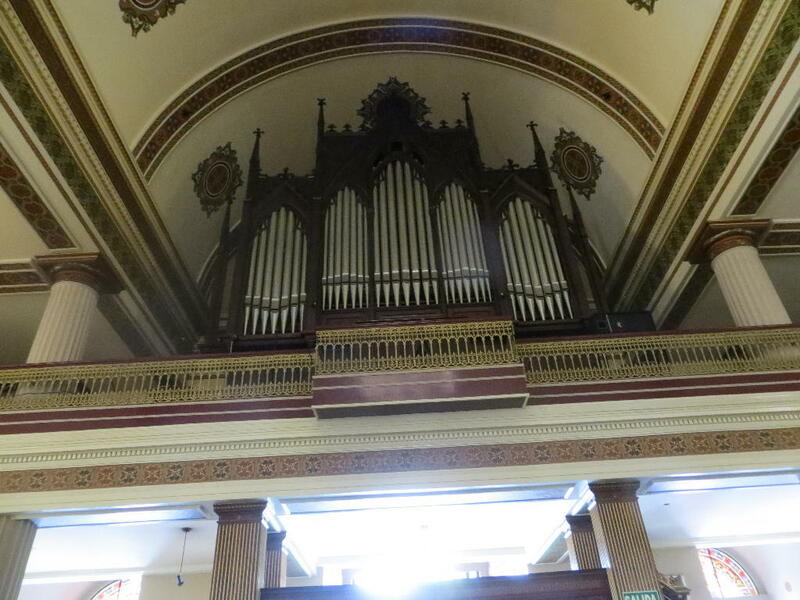 It has recently been restored, and it has been played by several great masters of organ music. I mentioned earlier in this article that the Metropolitan Cathedral was a historic building. 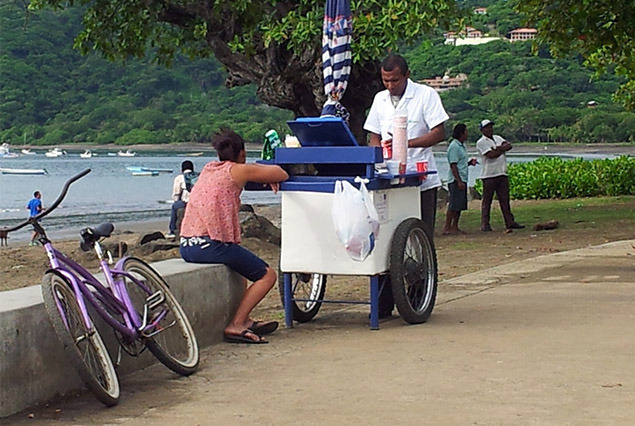 It has been the site of weddings and funerals of some of the most prominent people in Costa Rica’s history. However, by far and away, the most important event to take place at the Cathedral was the visit by Papa Juan Pablo Segundo (Pope John Paul II). 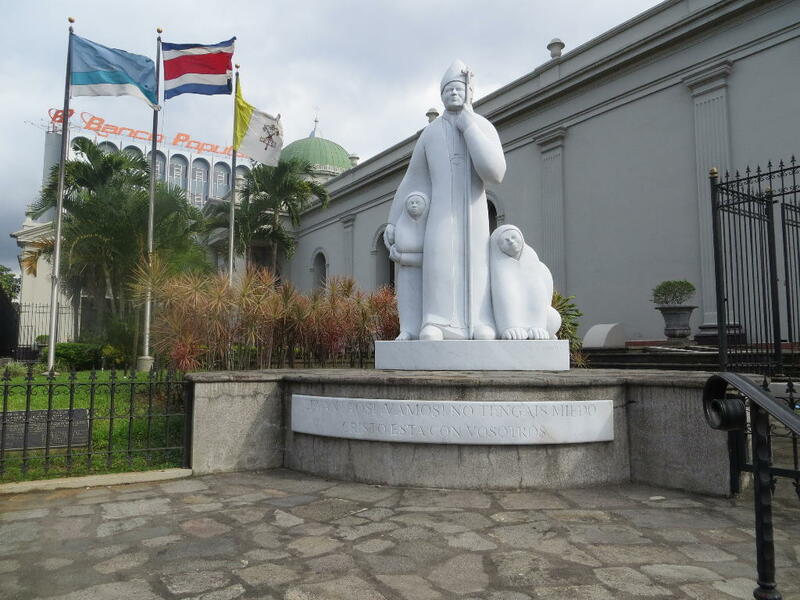 Two years after the death of John Paul, San José Mayor, Johnny Araya, and a group of citizens, raised money to have a statue created to commemorate the Pope’s visit. That statue is now mounted on the northwest corner of the Cathedral’s grounds. It is the work of renowned Costa Rican sculptor Jorge Jiménez Deredia, one of the few Tico artists to gain international acclaim. It stands 12 feet high, weighs 25 tons and is made from white Carrara marble from Italy. If you visit this beautiful old-world cathedral, be sure to be respectful if you arrive during a mass or other services. Even though this is a popular tourist attraction, it is still a place of worship. Do not go in wandering around and snapping pictures during a service. Mass is held throughout the day on Sundays starting at 7 a.m., and several times a day during the week. San José’s Metropolitan Cathedral is opposite the city’s busy Central Park. 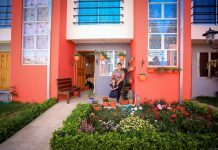 It is an important part of the daily life of people in Downtown San José. 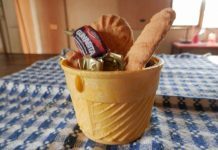 You can visit the Cathedral for free, but donations are greatly appreciated. There are donation boxes at the entrances. Keep in mind, it takes a great deal of money to maintain a building of this stature. Think about this: When it is your time to arrive at the pearly gates, and you are waiting for Saint Peter to decide which way you will go, a donation of a couple thousand colones to this beautiful Cathedral may be just enough to tip the balance in your favor. The Metropolitan Cathedral of San José, Costa Rica, features a facade with two bell towers and a clock tower. Behind the facade is the long nave, and at its eastern end is a small cupola, or dome, over the altar. 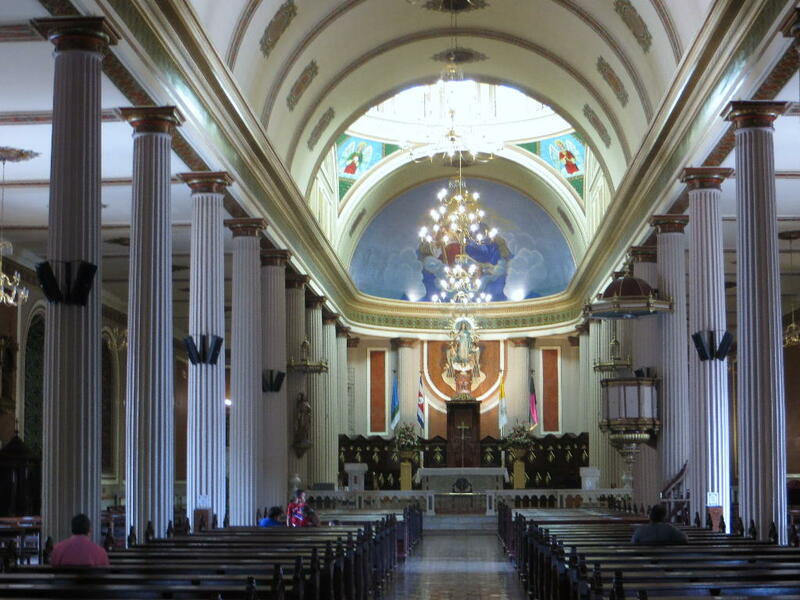 The Metropolitan Cathedral is well worth a visit, and it is an important feature of life in Downtown San José. It is all part of The Real San José. The Metropolitan Cathedral is located on Calle Central, between Avenida 2 and Avenida 4. 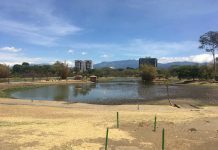 Its doors are open from 6 a.m. to 6 p.m.
Michael Miller is the author of the first and only guidebook that focuses on Downtown San José, Costa Rica, titled The Real San José. An electronic version of The Real San José is available on Amazon/Kindle. To access it, click here. 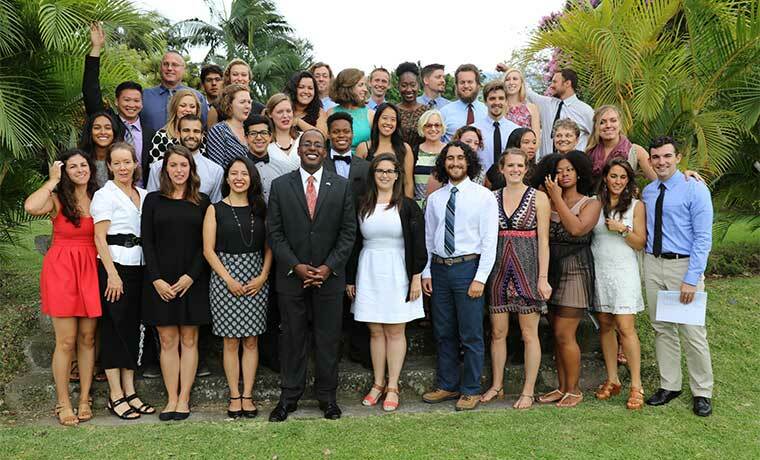 Next articleImmigration Status Unsure for Nicaraguans In The U.S.